Visit Pontiac for more information on the Pontiac Torrent. With its excellent ride and handling traits the stylish Pontiac Torrent returns for 2009 with more added standard features - ensuring that it will remain a popular choice in the crossover market. 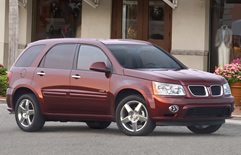 Two models are available: The 2009 Pontiac Torrent base model and the Pontiac Torrent GXP. Several packages are available such as the Preferred package which includes more than nine features such as steering wheel mounted audio controls, auto-dimming rearview mirror, and a remote vehicle starting system. The Premium package includes features such as heated driver and passenger seats and leather seating inserts. The Sun and Sound package includes a 260-watt Pioneer seven-speaker sound system with AM/Fm stereo with six-disc CD/MP3 player and a power sunroof. The interior of the 2009 Pontiac Torrent is spacious and comfortable. The rear seat slides about eight inches increasing cargo space behind the rear seat by almost five cubic feet. If more room is needed the seat also folds flat creating a cargo volume of 68.6 cubic feet behind the front seat. The Standard audio system is a six-speaker AM/FM stereo with CD/MP3 player and an auxiliary input jack for iPod/MP3 players. There are numerous entertainment upgrade options to choose from such as AM/FM/CD/MP3 player with DVD system, AM/FM/CD/MP3 with navigation system or AM/FM stereo system with six-disc CD changer, MP3 and DVD playback. The 2009 Pontiac Torrent GXP has an aggressive, athletic stance a unique hood and front fascia as well as detailed grille insert. An available chrome appearance package adds chrome roof rails, chrome front and rear skid plates, chrome grille, door hands and 17" chrome-clad aluminum wheels. There is three new exterior colors available to the Pontiac Torrent GOld Mist Metallic, Quicksilver Metallic and Cyber Gray Metallic. The base model Pontiac Torrent is powered by a 3.4 liter V6 engine that generates 185 horsepower getting 17 city / 24 highway mpg. The Torrent GXP gets a more powerful 3.6 liter V6 engine that cranks out 264 horsepower and 250 lb.-ft. torque with a an EPA estimated fuel economy of 16 city / 24 highway mpg. Numerous safety features are standard on the Pontiac Torrent and include dual-stage frontal driver and passenger air bags and head curtain side-impact airbags with rollover detection sensors, StabiliTrak electronic stability control system, electronic trailer sway, tire pressure monitor and ABS brakes.